A revised layers system and video recording make this great iPad art app even better. Procreate 3.2 for iPad is a powerhouse of mobile digital art, with system requirements to match. With a redesigned layers system, Photoshop file support and video streaming, Procreate is more versatile than ever. Procreate 3.2 is a powerhouse of a mobile digital art app, with system requirements to match. You don’t just need an iPad to run it: you need an iPad or iPad Pro capable of running the very latest iOS version – iOS 10 or iOS 11 beta – which limits the range of models that Procreate is compatible with. This is because Procreate developer Savage Interactive has invested in a state-of-the-art rendering engine before applying a raft of tools and options on top. This is no ordinary painting app. The basic template for this version was established with Procreate 3.0 in 2015, and version 3.2 builds on top of that release with some major new features. Procreate costs £5.99/$5.99 from the App Store. You can now import full Photoshop documents and retain their layers and blend modes: for example, iPad keyboard users can work faster with the help of keyboard shortcuts. The big two changes, however, are layers and video capture. A redesigned layers panel gives you more control if you’re creating complex illustrations, where having lots of layers is pretty much a given. You can now select multiple layers simply by swiping to the right on each layer you want to choose. This swiping mechanism is faster and easier than picking at checkboxes, and makes the Layers system feel more intuitive in use. The introduction of multiple layer selection leads to a host of possibilities. As well as moving them in the stack or deleting several layers in one go, for example, you can now group your selected layers together, then apply the same effects to the entire group. You can also use Transform functions on individual layers or groups, such as moving an element across the canvas or distorting its shape. The second major change is designed for artists who like to share their working process. Video support means you can now record yourself as you work; a switch preference enables you to choose whether to record your voice narration through the iPad’s microphone at the same time. You can then export the video file to edit in another app, or share it online. Better still, you can also stream your working process direct to the internet. This relies on the presence of a compatible streaming app, such as Periscope or Mobcrush, which use iOS’s Extensions system to appear as options within supporting apps. The execution is much simpler than the description: once you’ve got a streaming app installed, you just select Procreate’s streaming option, choose the streaming service you want to use, then 3, 2, 1... you’re live! If Procreate 3.2 has a fault, it’s that it’s in danger of becoming too powerful. The iPad app has so many tools and options that playing with them can distract from the artwork you’re supposed to be making. There’s an overwhelming choice of ways to customise any brush preset, for example. If you paint on your iPad because you want a spontaneous, rapid creative fix, you might find that working with Procreate is biting off more than you want to chew. 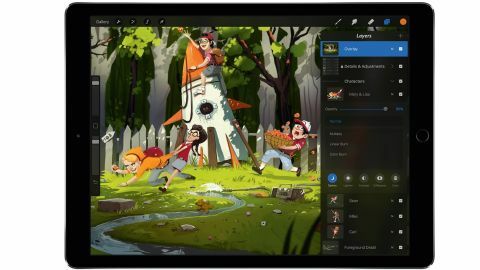 But if your vision of your iPad is as a substitute for your Windows or Mac OS computer, and you’re looking for the slickest, most powerful art app around, Procreate is a strong contender for the title. This review originally appeared in Imagine FX magazine. Subscribe today.